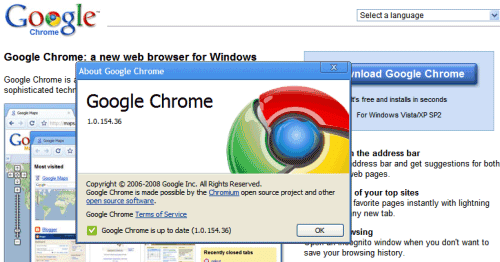 ~TECH-BYTES~: Google Chrome comes out of BETA,Isn't it too soon! Google Chrome comes out of BETA,Isn't it too soon! "We've heard a lot of feedback about product bugs and feature requests and have worked hard to prioritize work on them. We're excited to announce that with today's fifteenth release we are taking off the "beta" label," explains a post from Google Chrome Help Announcement blog. Ironically, the post doesn't look very well in Chrome. There aren't many differences between the first release of Google Chrome and the version released today: besides fixing bugs and improving the support for plug-ins, Chrome added a bookmarks manager. The browser still lacks many basic features and customization options: previewing feeds, print preview, customizable "new tab" page, form autocomplete (this feature will be added soon) and there are many issues that should have been fixed before even considering to remove the "beta" label. Google Chrome is not out of beta because it's ready, but because Google wants to sign some deals with computer manufacturers like Dell that will preinstall the browser. " The Google's open source browser has a number of eager customers, including OEMs who can't offer the browser until it is in full release," mentions TechCrunch. Even German's Federal Office for Information Security said that Google's browser is not for general use because it's still in beta. If that's price to increase the adoption, then Google didn't have to do much: just pretend that Chrome is ready for prime-time. "We have removed the beta label as our goals for stability and performance have been met but our work is far from done. We are working to add some common browser features such as form autofill and RSS support in the near future. We are also developing an extensions platform along with support for Mac and Linux," reminds us Google's blog.